State officials estimate that it will take $60 billion in long-term federal funds to repair and replace the houses, buildings and infrastructure Harvey damaged. HOUSTON — Texans whose homes were wiped out when Hurricane Harvey slammed ashore and dumped more than 50 inches of rain on some parts of this region may find that federal money allocated for long-term recovery won’t come close to meeting their collective rebuilding costs. The exact size of the shortfall is unknown — and could remain unclear for weeks or months as federal officials also grapple with the destruction of two subsequent hurricanes that damaged wide swaths of Florida and Puerto Rico. State officials estimate that Texas will need $60 billion in Housing and Urban Development disaster relief funds to fully rebuild houses, businesses, roads and other buildings and infrastructure that Harvey damaged. That’s far more than the $7.4 billion Congress has approved so far — and that money will be divvied up across the U.S. states and territories walloped by Harvey, Irma and Maria in less than a month. Congress is expected to appropriate more HUD money, but that is unlikely to completely cover the estimated long-term need in Texas. And because the full extent of the three hurricanes’ damage is still unknown, Texas officials are left waiting for Congress and federal HUD officials to determine how much money the state will receive — and how it can be spent. Brian Sullivan, a HUD spokesman, said the federal housing department’s disaster relief funds are intended to help individuals whose needs aren’t covered by private insurance, immediate FEMA assistance, small business administration loans and other assistance. “Because there is inevitably going to be gaps, all of these things aren’t going to be enough,” he said. U.S. Rep. Henry Cuellar, D-Laredo, said Congress can’t budget for the full amount of long-term aid until after cleanup efforts are done and they have a "better understanding" of the financial need. The state’s $60 billion estimate is for recovery efforts beyond the $2.7 billion in federal emergency funds, flood insurance program payments and small business administration loans that have already been disbursed for short-term needs like hotel room costs and apartment rentals. It’s also in addition to another $1 billion that the Federal Emergency Management Agency plans to give out through five programs that the state’s General Land Office is about to launch. Those five programs will fund things like temporary trailers for Texans whose homes are currently uninhabitable and home repairs that don’t exceed half of a home's market value. The $60 billion would be used for costlier house repairs, home rebuilds, infrastructure replacement and other major projects that can take years to finish after natural disasters like Harvey. That figure is about 50 percent higher than a previous estimate that officials made when the impact of the storm wasn’t fully known. “Beaumont and Port Arthur were still under water” at the time of the earlier estimate, said Heather Lagrone, the land office’s deputy director for the community development and revitalization program. Once Congress approves long-term housing recovery dollars, they have a long journey before sawdust starts flying and cement is poured. After the federal housing department determines how much each affected area receives — and attaches stipulations on how the money can be spent — the state must provide a plan describing how it will distribute the funds. Once the federal housing department approves that plan, state officials will then rely on local governments to prioritize how that money is spent. Texas Land Commissioner George P. Bush told state lawmakers Monday that it could take from seven to 32 months for the funds to work their way through the process. Beth Van Duyne, the regional HUD administrator for Texas and four other states, said she understands Texans don’t want to have their lives put on hold for years as relief funds trickle through bureaucracy. “We have to make sure that we’re spending as a little time as possible” on the process, Van Duyne said. But the federal assistance also has to be reviewed by a conglomerate of government agencies tasked with ensuring that taxpayer money is spent wisely. Van Duyne said that after Hurricane Katrina, houses rebuilt with HUD disaster relief funds in New Orleans were later damaged by water again because they were reconstructed in flood-prone areas. Because Harvey is Houston’s third catastrophic flood event in as many years, local officials are trying to determine which houses should be bought out by the government rather than rebuilt. The state's water agency, meanwhile, is working on a new statewide flood plan. And several government agencies are pushing for congressional funding for long-planned flood control projects. HUD disaster relief funds can also go toward projects that would mitigate future flooding. “I don’t want to be in the position of holding up funds, but let’s at least know how they’re going to be spent,” Van Duyne said. U.S. Sen. John Cornyn said on a call with reporters last month that members of Congress expect the Trump administration to request another $29 billion in hurricane relief funds, but that would also be split among states and territories affected by recent hurricanes — and only a portion would be earmarked for HUD disaster relief money. The Texas Republican said the state’s congressional delegation is working on a bipartisan request for the state. An exact figure for such a request hasn’t been disclosed. Meanwhile, as state land officials await decisions from the federal housing department, they are studying data about flood levels and home values — along with FEMA statistics on the number of people who have been approved for short-term assistance — to piece together what the eventual need will likely be. “We are definitely leaning forward as much as we can,” Lagrone said. 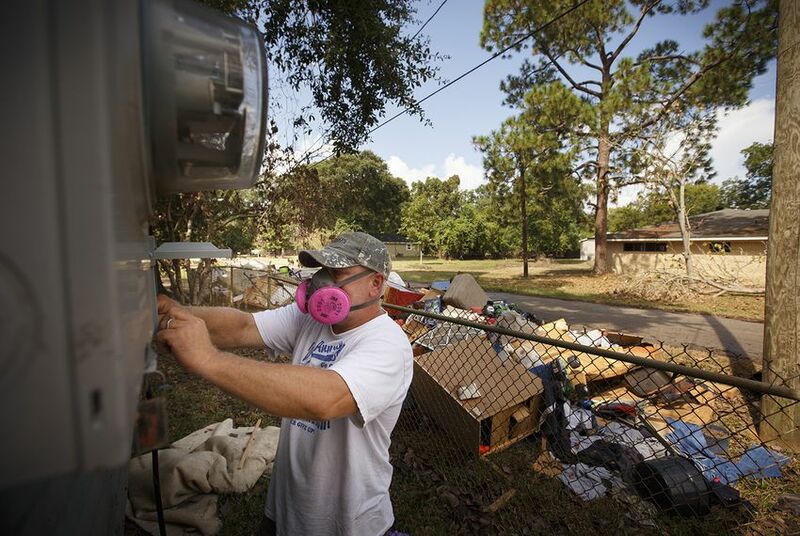 The disaster relief money is provided as community development block grants, which typically include a caveat that 70 percent of such funds go to low- and moderate-income Americans. The land office is asking HUD to lower that threshold to 50 percent of the allocated funds. Texans with completely destroyed homes who already received the maximum short-term FEMA payment, typically about $33,000, can still apply for long-term HUD disaster relief funds. “But we have to confirm that you used the $33,000 for its intended purposes — that you used it for housing,” Lagrone said. And some Texans whose houses will be rebuilt could find that they don’t end up in a similar home. For instance, a couple who bought a five-bedroom house when their now-grown children lived at home could end up with approval to only build a two-bedroom home. “We build you the house you need versus the house you had,” Lagrone said.